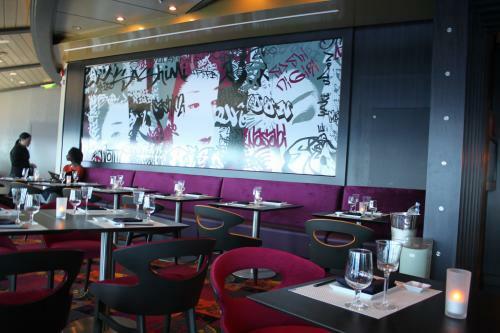 Another brand new specialty restaurant to Royal Caribbean's Navigator of the Seas is Izumi Japanese Cuisine. 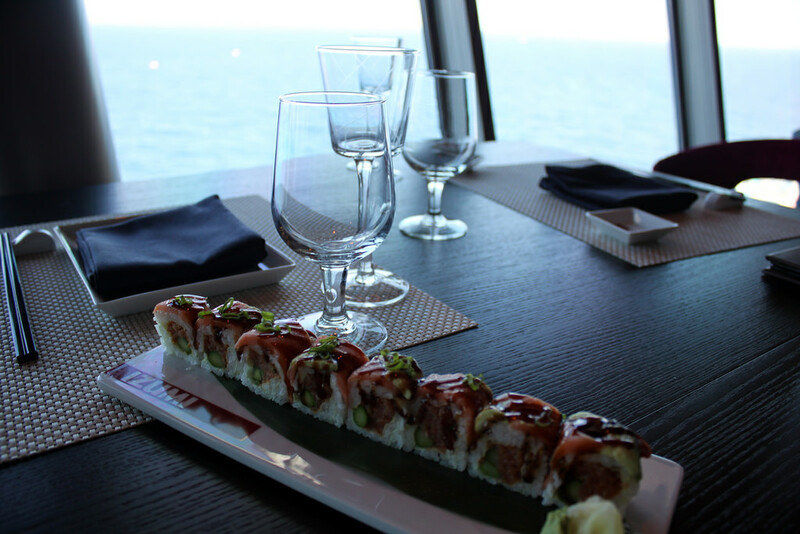 For fans of having sushi at sea, this is the place for you to get your fix! 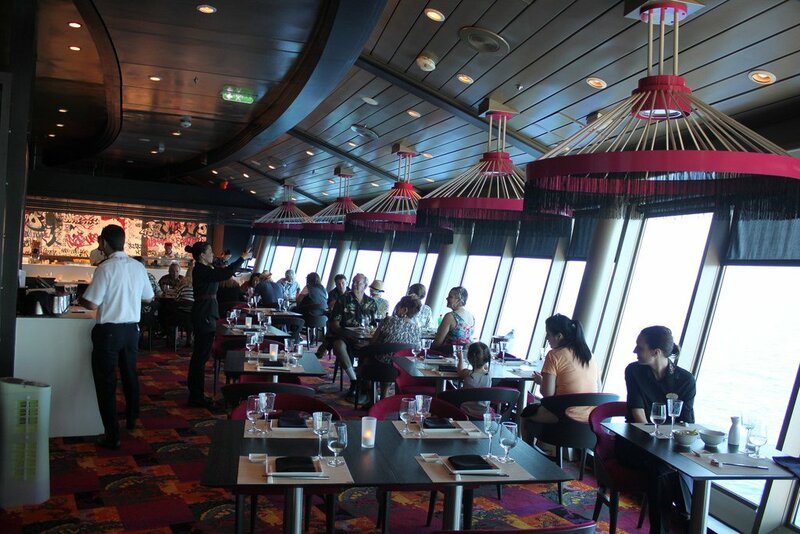 Izmumi is located all the way up on deck 14 near the Viking Crown Lounge and offers a great view of the ocean and pool deck below. The restaurant itself is a blend of reds and blacks and feels like a modern sushi restaurant you may have been to back home. The layout of the restaurant is somewhat crescent shaped, but it's mostly one large room with a small sushi bar in the back. 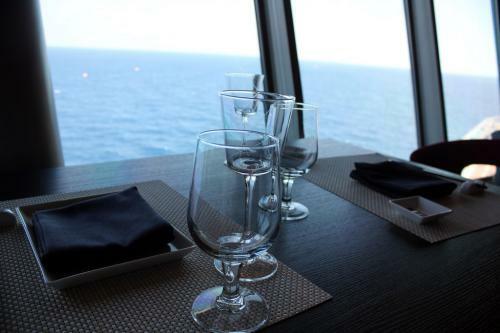 Most tables have a view out a window. Izumi's decor is simple but has the feel of a classy Japanese restaurant. 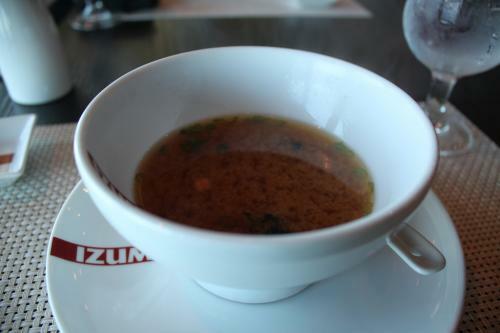 As you are seated, the waiter will bring you a warm towel to refresh yourself with and it helps sets the tone for your experience at Izumi. On our Navigator fo the Seas cruise, we sampled the lunch menu, which is an all-sushi menu. The dinner menu does offer non-sushi Japanese food, so keep that in mind when booking if you prefer more variety in your options. 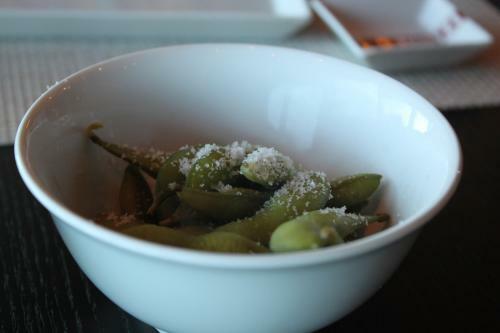 To start with, Izumi currently offers complimentary edamame (a preparation of baby soybeans in the pod boiled in water together salt, and served whole) and miso soup. Both were good but I think the edmame was better. I found the miso soup to be interesting given the color of the broth, which is usually clear but this was darker. The sushi menu at Izumi offers a number of choices to consider. Another difference between lunch and dinner is at lunch there are no daily special rolls to also consider. Lunch seems to be a strictly small menu with dinner greatly expanding the offerings. The choices of sushi rolls range from pedestrian to more elaborate in nature. Knowing that everyone has different tastes in sushi, I'll say I found the selection to be average. I wasn't blown away by the variety but it was still on par with most sushi restaurants I've found on land. I ordered a number of hand rolls during my visit to get a sense of the quality and size of the rolls. For me, really good sushi will not only have fresh and good tasting fish, but it will also be large in size. The signature rolls definitely passed my test for what constitutes good sushi for the good size of each piece and the freshness of the fish. I believe there are two comparissons to make, how Izumi compares to land restaurants and how it compares to cruise ship sushi. Compared to sushi on land, I'd say Izumi is at least average if not slightly above average. The traditional rolls were fairly tame (but then again, tuna rolls are hardly anything more than tame) and the signature rolls tasted as good as something I'd expect to find on land. Compared to cruise line sushi, it blows any sushi I've ever had in the Jade section of the Windjammer out of the water by far. It certainly held up to my memories of Izumi on Oasis of the Seas and I think Izumi is a great choice for sushi fans who are cruising. The other good thing about Izumi was the rolls were not only large in size but ample in serving. Each roll I ordered came with 8 pieces, which is a lot for any sushi roll. In terms of value, the pricing of Izumi has changed from what you may remember. Izumi on Navigator of the Seas has dropped the cover charge and simply charges a la carte. This is good since a cover charge was silly but the price of the rolls were more than I remember on Oasis of the Seas. Most signature rolls were $10 or more, which isn't cheap for sushi but the traditional rolls were all in the $6-7 range. I've seen far worse in terms of pricing and the complimentary edamame and miso soup does add back a little bit of value. Admittedly, I am a sushi fiend and can't get enough of the stuff so Izumi certainly made me happy while eating there. I think it's a great place for lunch or even pre-dinner appetizer. While the variety of sushi isn't the best I've ever found, I did find what they did make tasted great. 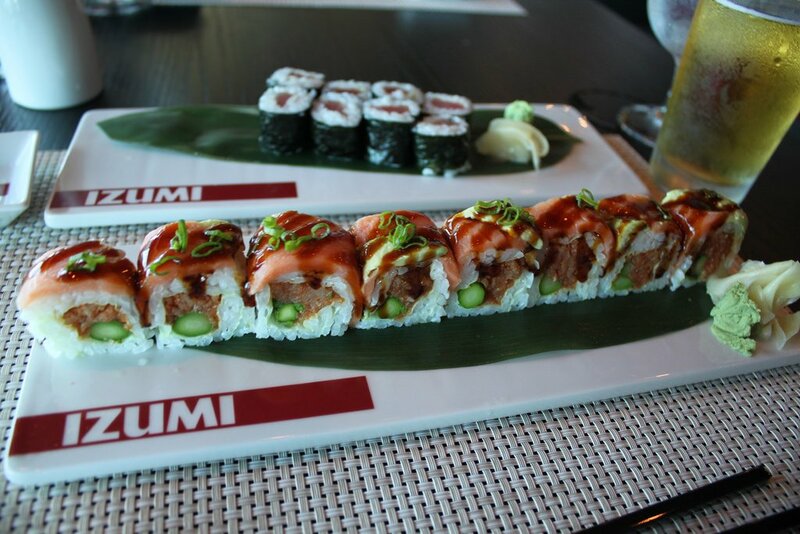 Sushi is as much an art as it is a means of sustenance and Izumi balances this fine line quite well. In terms of value, it's about what you would pay for sushi at home from a decent sushi joint, so I think it fits the bill when you want a little Japanese flavor during your cruise. 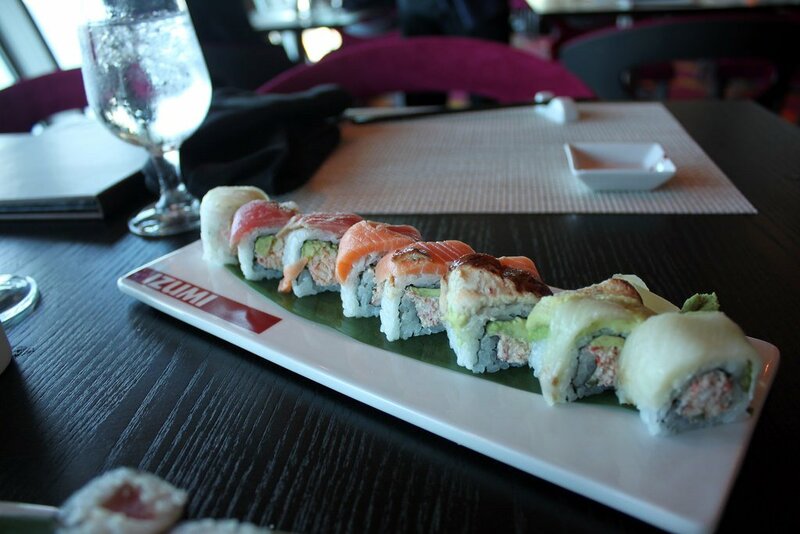 Izumi is open for dinner from 6:00pm to 9:30pm and for lunch at noon to 1:30pm. We reviewed Izumi on Navigator of the Seas.